Water Heaters in Spokane |Air Control Heating and Electric, Inc. 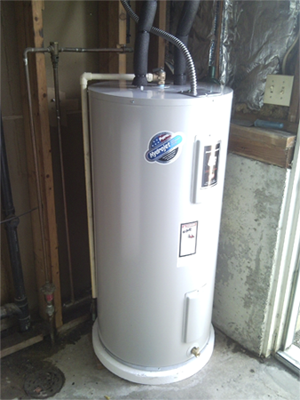 If you are need a new water heater in Spokane or Coeur d’Alene, You’ve come to the right place. Air Control Heating and Electric, Inc. specializes in replacement water heaters, for both residential and commercial uses. Residential water heaters heat the water in your home for washing, bathing, cleaning, etc. They come in gas or electric models. Gas models are up to 83% efficient. While unit replacement looks relatively simple, there are safety and operational considerations that only a professional will know about, so think twice before you head to the big-box stores. 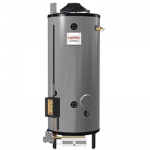 Essentially, commercial water heaters are large boilers that produce hot water for commercial uses. Commercial water heaters are commonly used in apartment buildings, rest homes, restaurants and hospitals. While many commercial water heaters are in the 200,000 BTUH range, Air Control Heating and Electric, Inc. has installed larger units up to 1,800,000 BTUH. If you have a large or complex water heating requirement, give us a call. 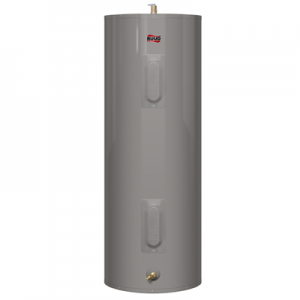 We will find the right water heater for your needs. Did you know: While most commercial water heaters are rated around 80% efficiency, new cutting-edge units have efficiencies up to 95%. Call us for details. Imagine- a 95% Efficient Gas Water Heater! The Ruud Spiderfire is a 95% Efficient Commercial Gas Water Heater. it is a milestone of progress–there is nothing like it in the market. Sizes range from 80-100g. While they are a relatively new product, Air Control Heating and Electric has installed a number of them, and we can report that they are working very well. So if your restaurant, apartment building or adult care home uses a lot of hot water, you need to consider this option. 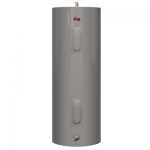 The Ruud G100-200 commercial water heater is an industry standard. It holds 100 gallons and is fired at 200,000 btuh for quick recovery. Perfect for any commercial application needing large amounts of hot water such as restaurants, rest homes and other care facilities. For homes or offices. Electric Water Heater sizes range from 2.5-80 gallons. Electric water heaters use clean low-maintenance electricity to heat your water. Cost of operation is slightly higher than natural gas, but much less than propane or oil. 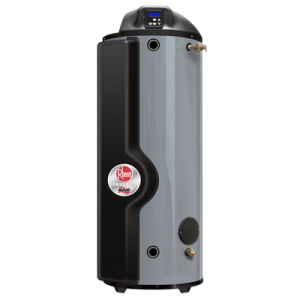 As a fully licensed electrical contractor, Air Control Heating and Electric can handle all aspects of replacing your existing electric water heater, or installing a new one from scratch. Gas options are available in 40-120 gallon sizes for Residential or Commercial uses.